Make more money from your affiliate marketing. AffiliateDefense gives you powerful, free tools to make you a more successful affiliate marketer. Know exactly which of your traffic sources are converting to commissions. 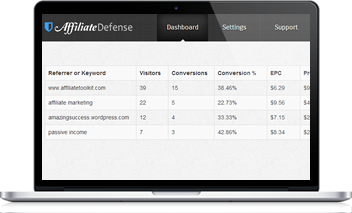 AffiliateDefense tells you exactly where each individual visitor came from and which ones converted to a sale. Stop wasting money on failed campaigns and double down on ones that work. Turn your long, ugly affiliate links into simple, user friendly links that get higher click through rates. Protect your commissions from other affiliates who might inject their affiliate id into your links and steal your commissions. See all of your affiliate reports and statistics in one place. AffiliateDefense consolidates all your reports from different networks into one easy to view dashboard. Sign up and start increasing your commissions today.